It is usually between 6–20 mm (¼ in and ¾ in), but may grow larger. It is brown and sometimes an almost deep yellow color and usually has markings on the dorsal side of its cephalothorax, with a black line coming from it that looks like a violin with the neck of the violin marking pointing to the rear of the spider, resulting in the nicknames fiddleback spider, brown fiddler or violin spider. In the mature brown recluse spider as well as some other species of recluse spiders, the dark violin marking is well defined, with the neck of the violin pointing toward the bulbous abdomen. The abdomen is uniformly colored, although the coloration can range from light tan to dark brown, and is covered with numerous fine hairs that provide a velvety appearance. The long, thin, brown legs also are covered with fine hairs, but not spines. 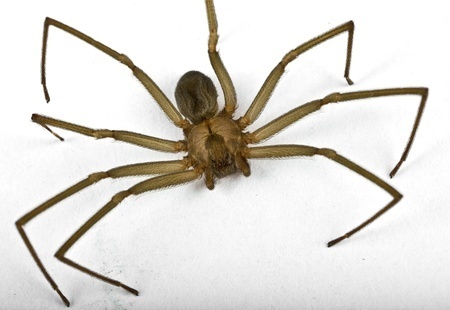 Adult brown recluse spiders have a leg span about the size of a quarter. Their body is about 3/8 inches long and about 3/16 inches wide. Males are slightly smaller in body length than females, but males have proportionally longer legs. Both sexes are venomous. The immature stages closely resemble the adults except for size and a slightly lighter color. Whereas most spiders have eight eyes, recluse spiders have six eyes that are arranged in pairs in a semicircle on the forepart of the cephalothorax (see close-up view). A 10X hand lens or microscope is needed to see this diagnostic feature. In order to determine the exact species of Loxosceles, the spider's genitalia need to be examined under a high-power microscope.